September is here and, although we have enjoyed a long hot summer, autumn is approaching. I love autumn, seeing the leaves change colour into many beautiful hues, as nature prepares to reset and the circle of life keeps turning. The trees survive the harshest of conditions despite losing their leaves to strong autumn gusts. Their roots keep them grounded and at one with the earth and, once again, when spring comes around the tree will produce leaves. Similarly, our Root Chakra helps us cope with all that life throws at us. The Root Chakra connects us to the earth and keeps us grounded securely. It helps us as we look for our basic survival needs – not just food and shelter but our emotional survival which is just as important to our wellbeing. Just as the tree needs healthy and secure roots, so do we as we develop, needing a supportive family relationship based on love, trust and fair discipline in order to survive and flourish. It is important that our Root Chakras are balanced properly. An overactive Root Chakra can lead to greed, bitterness and envy. An underactive Root Chakra can lead to eating disorders, feeling that a person never has enough or that they are not good enough. Both under and overactive Root Chakras are a result of fear. If your Root Chakra is not properly balanced then, like a tree with weak roots, it will weaken the rest of the body and this will have a detrimental effect upon all of the other chakras leading to emotional, physical and mental health issues. Reiki and crystal healing treatments can help to balance the Root Chakra – the best crystals to use in this balancing are garnet or red jasper as their colours match the beautiful red colour of the chakra itself. 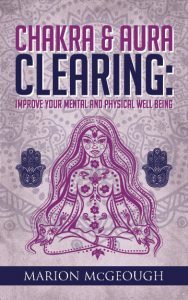 For more information on chakra and aura balancing and healing then you can either read about it in my book: Chakra & Aura Clearing. Alternatively you can take one of my popular courses or, if you need advice about your chakras, aura or to book a treatment session then please get in touch with me.